By the time of his death in 2003, Edward Said was one of the most famous literary critics of the twentieth century. Said’s work has been hugely influential far beyond academia. As a prominent advocate for the Palestinian cause and noted cultural critic, Said redefined the role of the public intellectual. This volume explores the problems and opportunities afforded by Said’s work: its productive and generative capacities as well as its in-built limitations. 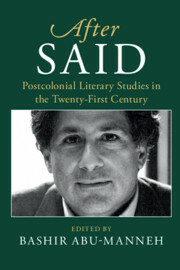 After Said captures the essence of Said’s intellectual and political contribution and his extensive impact on postcolonial studies. It examines his legacy by critically elaborating his core concepts and arguments. Among the issues it tackles are humanism, Orientalism, #culture and imperialism, exile and the contrapuntal, realism and postcolonial modernism, world literature, Islamophobia, and capitalism and the political economy of empire. It is an excellent resource for students, graduates and instructors studying postcolonial literary theory and the works of Said.